More than 1.1 million hours of service by nearly 11,500 students. More than 150 community partners. An expanded alternative break program includes fall, winter and summer as well as spring break. Roughly one academic class in four incorporates service into the curriculum. As impressive as these things are, they represent just a part of Indiana State University's commitment to serving the community. It's a commitment that has earned Indiana State a No. 1 ranking for service by The Washington Monthly magazine and helped secure a No. 20 overall ranking out of nearly 280 national universities, the highest of any college or university in Indiana or Illinois. While it is common for universities to "do" community service, few have the institutional commitment that Indiana State has. "We certainly have supported it more than other institutions have," said Nancy Rogers, vice president for university engagement. "When we talk to our colleagues at other colleges and universities they can't believe how much support we have and how integrated it is in the day-to-day work of the university. It's part of New Student Orientation; it's an important part of our student work program; it's integrated in some capacity in every academic program." Created in 2014 to underscore the significance of Indiana State's service efforts and to bring all components of that effort under a single vice-presidential area, the Division of University Engagement includes not only the Center for Community Engagement, which oversees student service and tracks service learning, but also the Business Engagement Center, Career Center and Student Employment, Community School of the Arts, Conference and Event Services, Hulman Center and the Institute for Community Sustainability. The Business Engagement Center works with new and existing small businesses and not for profit organizations not only in Terre Haute but also throughout the state and in Illinois. "We assist them with growing their businesses, developing business plans and marketing," said Daniel Pigg, the university's director of business engagement. "We're non-selective on who we work with. We're very open. We average one new project a week." The work is done by both professional staff and by Sycamore Business Builders, which is comprised of students who use the skills they've learned in class to conduct market studies, design web sites and help businesses learn to use social media. The Business Engagement Center's efforts complement the work of the West Central Indiana Small Business Development Center, housed in the Scott College of Business, and Sycamore Business Advisors, a senior capstone class of business students, Pigg noted. The center operates on a much shorter time frame than Sycamore Business Advisors, which undertakes semester-long projects for business clients, Pigg said. Sycamore Business Builders operates on one- or two-week deadlines, he said. The Business Engagement Center is housed in the John T. Myers Technology Center and staff are putting the finishing touches on a 3,000-square-foot Sycamore Innovation Lab that will incorporate three-dimensional printing, computer numerical control machines and unmanned systems. 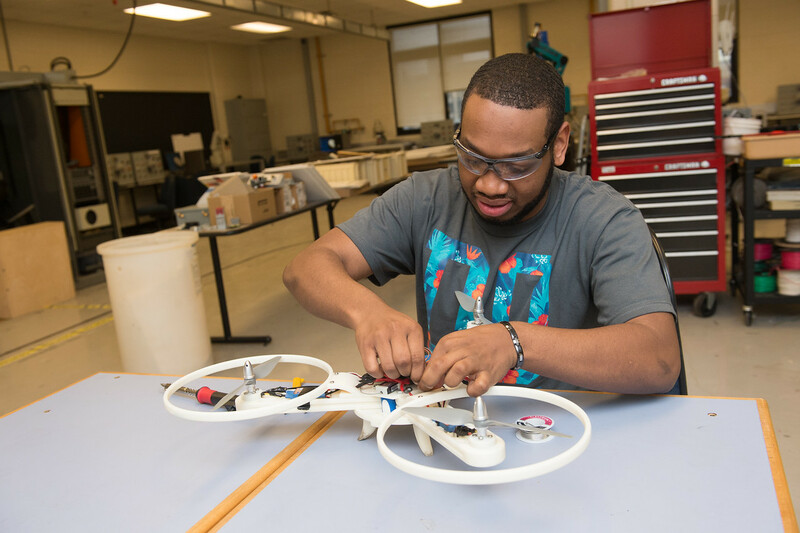 A grand opening and open house for the lab is scheduled for Feb. 26 from 1 - 4:30 p.m. and will include demonstrations of 3-D printing and unmanned vehicles. The event will immediately precede Startup Weekend, a 54-hour program hosted by Indiana State's Scott College of Business that is designed to help entrepreneurs find business partners with a common mission with whom to launch a startup. 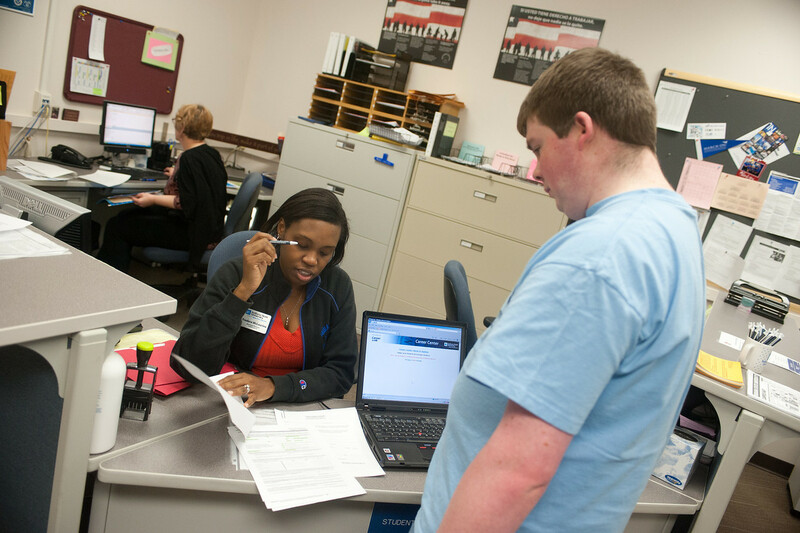 The Career Center and Student Employment at Indiana State are working to create more service learning and career based opportunities for students. "Serving the community is at the heart of the work we do," said Tradara McLaurine, assistant director of Career Services. "Through our student employment programs, we work in partnership with several non-profit agencies in the community to provide them with a talent force that is able to help them achieve their mission." Participation in the Federal Work Study program allows agencies to have the program pay for 75 percent of students' salaries, and up to 100 percent for positions directly related to math and/or reading tutoring and family literacy. "Our students gain real-world work experience, gain an understanding that these agencies are a vital part of our community and the agencies are able to save money from their budgets that can now go toward direct care of their clients and service to the community. It's a win-win formula for both of us," McLaurine said. The Career Center also serves the community via employer outreach and on-campus recruiting programs, noted Assistant Director Teresa Dwyer. Services range from posting a job on Sycamore Career Link, the university's online job board, to holding information sessions on campus to promote positions and identify suitable projects for internships. "As companies are challenged with finding qualified employees to fill their open positions, we provide many free services to assist them with building their talent pool," said Dwyer. "The benefits are two-fold. These experiences provide degree-related experience to our students and provide companies with the needed support to complete some of their back-burner projects." Community School of the Arts conducts dozens of programs throughout the year for people of all ages. Conference and Event Services arranged more than 260 events during the past year with an estimated total attendance of more than 189,000 people. Hulman Center and Tilson Auditorium are legendary for hosting sporting events and big-name entertainers at events like the Performing Arts Series, which this year includes Herman's Hermits, the holiday favorite "Mooseltoe" and the musical "Ragtime." University Speakers Series also operates under the Hulman Center/Tilson staff. The Institute for Community Sustainability maintains the university's Community Garden and is working with Terre Haute city officials and the Environmental Protection Agency on plans to return vacant properties in the city to productivity in a sustainable, environmentally friendly way. Why does Indiana State have such a commitment to service? "We're trying to develop young adults into people who will care about their communities, be capable of taking care of themselves and their loved ones, both financially and emotionally, and also to contribute to the greater society," said university President Dan Bradley. "There is data that says students who are engaged as young people continue to be engaged as adults. We also have all of this collective energy here that is capable of having an impact on the community and the community is certainly in need." Service comes naturally to students at Indiana State, Bradley suggested. More than half of all students are the first in their families to attend college and/or come from low income families and have seen firsthand how people can help one another. "Many of our students see the value to the participants and to themselves," he said. "I think it is a generational thing that students are interested in doing these kinds of things." Indiana State University's commitment to service is far reaching. In addition to students, faculty and staff helping out in the community, it encompasses economic development, workforce preparedness and sustainability.